Koninklijke Racing Club Genk is a Belgian professional football club based in the city of Genk in Belgian Limburg. Racing Genk plays in the Belgian Pro League and have won three championship titles; in 1998–99, in 2001–02 and in 2010–11. They also won four Belgian Cups, most recently in 2008–09 and in 2012–13. They qualified for the UEFA Champions League group stage in the 2002–03 and 2011–12 seasons. Mechelen is a city and municipality in the province of Antwerp, Flanders, Belgium. The municipality comprises the city of Mechelen proper, some quarters at its outskirts, the hamlets of Nekkerspoel (adjacent) and Battel, as well as the villages of Walem, Heffen, Leest, Hombeek, and Muizen. The Dyle flows through the city, hence it is often referred to as the Dijlestad. Yellow Red Koninklijke Voetbalclub Mechelen, often simply called KV Mechelen or KVM, or by their former French name FC Malinois, is a Belgian professional football club based in Mechelen in the Antwerp province. KV Mechelen plays in the Belgian Pro League. They have won four Belgian championships and one Belgian Cup, as well as the 1987–88 European Cup Winners' Cup and the 1988 European Super Cup. They collected all of their honours in the 1940s and in the 1980s. The 2004-05 season of the Belgian First Division began on August 6, 2004 and ended on May 23, 2005. Club Brugge became champions on May 15, 2005 after a decisive game against long-time rivals Anderlecht. The season was full of suspense as the champions and the relegated teams were only known on the 33rd matchday. Furthermore, the 3rd place had to be decided on a test-match, a fact that had not occurred recently. Defour joined Standard on a five-year deal,  being appointed team captain at the start of his second year after taking over from Portugal's Sérgio Conceição – he was just 19 years old. He received the Belgian Golden Shoe at the end of the season in the process, leading the Reds to their first league title in 25 years. The 2007–08 season of the Belgian First Division began on August 3, 2007 and concluded on May 10, 2008. The championship was decided in the 31st round on April 20, 2008, when Standard Liège beat Anderlecht 2–0 at home. For Standard it was their 9th League Championship, but just their first in the last 25 years. At the other end of the table, Brussels and Sint-Truiden were relegated on matchdays 31 and 32 respectively. Behind Standard, Anderlecht and Club Brugge fought until the end for the second place which gives right to a place in the qualifying rounds of the UEFA Champions League 2008-09. On the penultimate matchday, Anderlecht won against Brugge with 2–0 which proved decisive in the end for them to become second. Sérgio Paulo Marceneiro da Conceição is a Portuguese former footballer who played mostly as a right winger and is the manager of Porto. In late 2009, shortly after scoring four goals in 31 games to help Standard renew its domestic supremacy, Defour broke his right foot. During his period of recovery he received a letter from Alex Ferguson, manager of Manchester United, wishing him all the best in his recovery,  and this led to persistent rumours of a switch to the English club, but he refuted these by saying "I do know that Manchester United are monitoring me – if everything goes well and I continue playing as I am, there is a better chance of me leaving than there was at the start of the season";  eventually, nothing came of it. On 15 August 2011, Portuguese club FC Porto agreed with Standard Liége  to buy the sporting rights of Defour for €6 million, and he signed a five-year contract. He finished his first year with 37 appearances all competitions comprised and added two goals, helping his new team win the Primeira Liga championship. Anthony Henri Vanden Borre is a Belgian footballer who last played as a defender for TP Mazembe in DR Congo. Vanden Borre has previously played for clubs in Belgium, Italy, England and France. He won 28 caps for the Belgium national team. He is capable of playing as both a right back and a right winger. Arend "Arie" Haan ˈɦaːn]; born 16 November 1948) is a Dutch football manager and former player who played as a midfielder. He scored 6 goals in 35 matches for the Dutch national squad of the 1970s. At club level he enjoyed a successful career with AFC Ajax, R.S.C. Anderlecht, Standard Liège and PSV Eindhoven. Jelle François Maria Van Damme is a Belgian international footballer who can play as a central defender, left-back or left sided midfielder. 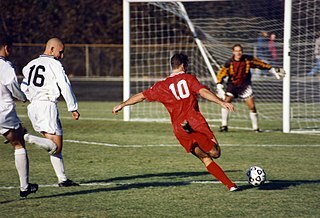 He currently plays for Royal Antwerp, and has previously played for clubs in Belgium, England, Germany, the Netherlands, and the United States. He also has over 30 caps for the Belgium national football team. The 2006–07 season is the 104th competitive season in Belgian football. Dániel Tőzsér is a Hungarian footballer who plays for Debrecen and the Hungarian national football team as a midfielder. Tőzsér is left-footed and plays central, defensive or on the left side of midfield. He is known for his impressive free-kick abilities. Igor Albert Rinck de Diver Camargo, known as Igor de Camargo, is a Belgian footballer who plays for Mechelen as a striker. Jelle Vossen is a Belgian professional footballer who plays as a striker for Club Brugge K.V. Sinan Bolat is a Turkish football goalkeeper who plays for Royal Antwerp. He has played for Turkey both at youth level and senior level. Axel Laurent Angel Lambert Witsel is a Belgian professional footballer who plays for German club Borussia Dortmund. During his play for the Belgium national team, he came into the first team as a right-winger, and can also play attacking midfielder, though his natural position is as a central midfielder. Mehdi François Carcela-González is a Moroccan-Belgian professional footballer who plays as a midfielder for Standard Liège and the Morocco national team. Eliaquim Hans Mangala is a French professional footballer who plays as a centre back for English Premier League club Manchester City and the France national team. Nikolaos "Nikos" Karelis is a Greek professional footballer who plays for PAOK FC on loan from K.R.C. Genk. Karelis is a left-footed forward. Paul-José M'Poku Ebunge is a Congolese footballer who plays as a winger for Standard Liège. Standard Liège did not manage to win a trophy in the 2006–07 season, falling short to Club Brugge in the domestic cup final, and finishing some way behind champions Anderlecht in the domestic league. The main disappointment was failing to qualify for either the UEFA Champions League or the UEFA Cup group stages, which saw Johan Boskamp being sacked already on 30 August. He was then replaced by legendary goalkeeper Michel Preud'homme for the remainder of the season. 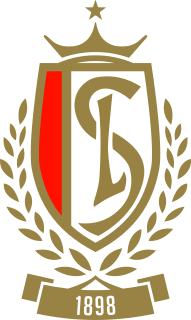 Standard Liège lost just one match all league season, winning the Belgian First Division for the ninth time in club history. The season marked the breakthrough of teenage midfield duo Marouane Fellaini and Steven Defour, while strikers Milan Jovanović and Dieumerci Mbokani were right up there in terms of the top scoring charts of the domestic top division. The UEFA Cup run ended early, being knocked out to eventual winners Zenit Saint Petersburg in the last qualifying round. Dennis Praet is a Belgian footballer who plays as an attacking midfielder for U.C. Sampdoria. Youri Marion A. Tielemans is a Belgian professional footballer who plays as a midfielder for Leicester City of the Premier League, on loan from Ligue 1 club Monaco, and the Belgium national team. 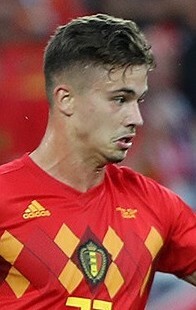 Leander Dendoncker is a Belgian international footballer who plays as either a defender or defensive midfielder, for Premier League club Wolverhampton Wanderers on loan from Anderlecht. Răzvan Gabriel Marin is a Romanian professional footballer who plays as a midfielder for Belgian club Standard Liège and the Romania national team. 1 2 "Steven Defour". 11v11.com. AFS Enterprises. Retrieved 16 April 2017. ↑ "Defour 'slachtoffer' van 33 jaar oude vete" [Defour 'victim' of 33-year-old feud]. Het Nieuwsblad (in Dutch). 5 May 2006. Retrieved 9 January 2014. ↑ "Transfer Defour naar Ajax van de baan" [Defour's transfer to Ajax not happening] (in Dutch). Voetbal International. 7 June 2006. Retrieved 9 January 2014. ↑ "Steven Defour verbreekt contract bij Genk" [Steven Defour breaks contract with Genk]. Het Belang van Limburg (in Dutch). 16 June 2006. Retrieved 9 January 2014. ↑ "Standard neemt Steven Defour over" [Standard signs Steven Defour] (in Dutch). Voetbal België. 11 July 2006. Retrieved 9 January 2014. ↑ "Comunicado" [Announcement](PDF) (in Portuguese). FC Porto. 15 August 2011. Archived from the original (PDF) on 24 December 2011. Retrieved 18 August 2011. ↑ "Comunicado" [Announcement](PDF) (in Portuguese). FC Porto. 16 August 2011. Archived from the original (PDF) on 15 December 2011. Retrieved 18 August 2011. ↑ "FC Porto deal for Defour". ESPN Soccernet. 16 August 2011. Retrieved 30 August 2011. ↑ "Porto extend Dinamo losing streak". UEFA. 18 September 2012. Retrieved 7 January 2014. ↑ "Santa Cruz sends Málaga into last eight". UEFA. 13 March 2013. Retrieved 7 January 2014. ↑ "Anderlecht's Steven Defour sees red over Standard Liège fans' banner". The Guardian . 25 January 2015. Retrieved 25 January 2015. ↑ "Standard Liege: Steven Defour sent off after fans' horror banner". BBC Sport. 25 January 2015. Retrieved 25 January 2015. ↑ "Burnley: Defour joins the Clarets". Burnley F.C. 16 August 2016. Retrieved 16 August 2016. ↑ "Steven Defour: Burnley sign Belgium midfielder from Anderlecht". BBC Sport. 16 August 2016. Retrieved 16 August 2016. ↑ "Keane, Defour and Gray stand out as Burnley stun Liverpool". ESPN FC. 20 August 2016. Retrieved 4 March 2017. ↑ "Defour is cheap as chips – Dyche". BBC Sport. 10 September 2016. Retrieved 4 March 2017. ↑ "René Vandereycken roept negen debutanten op" [René Vandereycken calls up nine first-timers]. Het Belang van Limburg (in Dutch). 6 May 2006. Retrieved 9 January 2014. ↑ "Defour a déjà marqué contre l'Estonie: "Ah bon? J'avais oublié"" [Defour already scored against Estonia: "Ah good? I had forgotten"] (in French). RTBF. 12 November 2016. Retrieved 4 March 2017. ↑ "Scotland 0–2 Belgium". BBC Sport. 6 September 2013. Retrieved 4 March 2017. ↑ "Belgium World Cup 2014 squad". The Daily Telegraph . 4 June 2014. Retrieved 27 June 2014. ↑ "Koreans crash to ten-man Belgium". FIFA. 26 June 2014. Retrieved 27 June 2014. ↑ "Steven Defour to focus on Burnley after international retirement". Lancashire Telegraph . 25 May 2018. Retrieved 25 May 2018. 1 2 3 4 5 6 7 8 9 10 11 12 13 "S. Defour". Soccerway. Retrieved 16 August 2016. 1 2 "Steven Defour". European Football. Retrieved 18 August 2016. 1 2 "S. Defour –Trophies". Soccerway. Perform Group. Retrieved 26 April 2017. ↑ "Belgium – Player of the Year Awards". Rec.Sport.Soccer Statistics Foundation . Retrieved 26 April 2017. Wikimedia Commons has media related to Steven Defour .